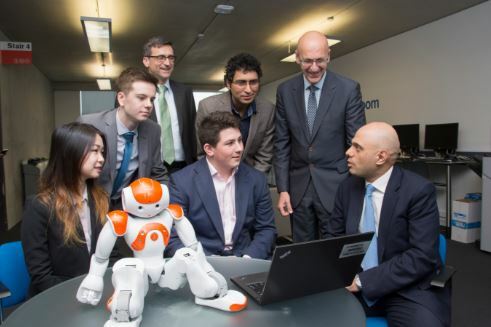 A new multi-million pound fund to increase the number of degree apprenticeships available to young people has been launched today by the Business Secretary Sajid Javid on a visit to Manchester Metropolitan University. First launched in September last year, degree apprenticeships allow apprentices to study for a full Bachelors or Master’s Degree while working. Universities and employers across the country are getting on board with institutions including Sheffield University and Queen Mary’s University London working in partnership with top employers such as TFL, Nestle and BAE Systems. The new funding will help even more people get a degree while earning in one of the country’s top businesses, by ensuring more opportunities are available. £8 million will be focused on supporting universities to design and deliver new degree apprenticeships while a further £2 million will be devoted to encouraging more learners to choose degree apprenticeships. The fund will run for the next two years and the process for universities bidding for the funds will be announced in April. Research from Universities UK published last week as part of National Apprenticeship Week found that while degree apprenticeships are relatively new, numbers are growing at a positive rate, with an estimated 1,500 – 2,000 starts for 2016 across 40 universities. “We launched degree apprenticeships to unlock life changing opportunities for young people and give businesses the skills they need." Designed by employers, universities and professional bodies, degree apprenticeships deliver the high level skills businesses need and offer young people an alternative to a traditional degree. Ministers are working to strengthen the reputation of on-the-job training by raising standards, creating thousands more places and protecting the term apprenticeship in the same way as degrees. More than 60 people are already studying at Manchester Metropolitan University as part of their Digital and Technology Solutions Professional degree apprenticeship. The course sees students working in leading employers such as Barclays, Lloyds and Astra Zeneca and with local employers Reality Mine, and MC2. Manchester Metropolitan University is planning to deliver chartered manager degree apprentices from Sept 2015 with major national employers as well as data analyst and cyber security options of the Digital and Technology Solutions Professional apprenticeship. Provisional figures released yesterday show a dramatic increase in the number of people starting higher apprenticeships. The official figures show that there were more than 30,000 people on higher apprenticeships between August 2015 - January 2016. The figures also show that there are more young people starting apprenticeships, with over 84,000 starts by under 19 year olds between August 2015 – January 2016.